"A 4G system is expected to provide a comprehensive and secure all-IP based solution where facilities such as ultra-broadband (giga-bit speed such as 100+ MiB/s) Internet access, IP telephony, gaming services, and streamed multimedia may be provided to users." 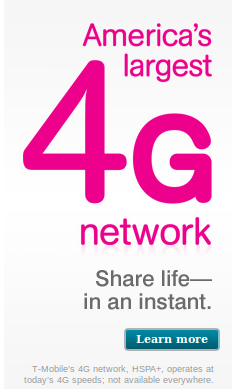 By this definition, none of the before mentioned companies actually have a "4g" network. Sprint and Clear offer "WiMax" networks and T-Mobile really has "HSPA+". Both of these types of networks current max out around 10MiB/s - falling far short of the denoted 100+MiB/s required of a true "4g" network. That small text at the bottom you ask? It states the network is really HPSA+, also known previously as "3.5g". Between October and November of this year (2010) T-Mobile rolled out HSPA+ in a good number of new towns around the United States. So while their network isn't really "4g" this faster "3g" connection is now more readily available than before. Something T-Mobile hasn't advertised quite as much as their larger, faster network is that, without notifying any of their customers, in October they cut the amount of data each user is allowed per-month from 10gb down to 5gb. In case you didn't know your "unlimited" data plan from T-Mobile has a limit to how much data you are allowed at "4g/3g" speeds each month. Once you go beyond this limit the service to your hand held is cut down to "2g" for the remainder of the month. So while T-Mobile's HSPA+ is on par speed wise with Sprint's WiMax network, with Sprint you will enjoy your fast mobile internet as much as you want - while with T-Mobile you are decently limited. At any rate, even though I love my N900 I think it is time I start looking into "4g" hand-helds with Sprint. I've played with samsung epic and htc evo. Both are good devices. The epic has a keyboard though. Consider switching to Virgin Mobile's MiFi. It's 3G, but no limits. Available at any Walmart store in the US.